2. Consider using Masking or Duct Tape on the front down-tube & seat tube of your bicycle to protect the paint finish while test fitting the engine to your donor bike. See Figure 1. This adapter plate is included in kit. Bike with large front frame tube: Use ¼” thick 1-1/8” x 2-1/2” steel plate with one hole in the center for a bolt to go through a drilled hole in tube frame and two holes for cap screws to go into engine block. Additional spacers maybe required depending on the donor bike. 4. If the rear frame tube from the seat down to the pedal sprocket is too small to fit the rear engine mount, a rubber shim can be made from an old bicycle rubber inner tube. This also helps reduce engine vibration. 6. After the desired engine location is determined mount the engine to frame. Lock nuts and or use of Loctite is recommended to avoid loosening due to vibration. Note: All threads on hardware nuts and bolts are metric. The Drive Chain Sprocket mounts on left side of the rear wheel against the spokes dish side in. The sprocket must fit over the hub in a perpendicular plane with the axle. This insures that your rear chain sprocket spins true with the rear bike wheel. *NOTE: On some older bike axle hubs like on coaster brake models it may be required to slightly enlarge the sprocket center hole to obtain a flush, and concentric fit next to the spokes. This is best done on a engine lathe by a professional machinist.. . It is also recommended that the rear wheel be re-spoked to 12 to 14ga. spoke wires to insure long life. Most any Bike shop can do this operation for you. Applying thread adhesive and equal tightening of the sprocket bolts. This keeps the chain sprocket true with axle and free from wobble while spinning. With bike upside down spin wheel and check sprocket for wobble. The chain can jump off the sprocket if the sprocket installation is done incorrectly. 1. Rotate sprocket on hub to allow clearance for mounting bolts that must come through the spokes..
2. If not pre sliced, cut the rubber isolator to the center, in order to fit INSIDE the spokes and around axle. Install the split steel retainer plates next to the rubber isolator and on the opposite side of the spokes. Secure with 9 bolts compressing the chain sprocket to the spokes. Note: 2 rubber isolators may be needed on both sides of sprocket for chain alignment on some older non-coaster brake bikes like made in China. 3. The Chain Sprocket on the Wheel must align with the Chain Sprocket on the Engine. The drive chain can be shortened to the correct length. Special tools are required to remove and replace the master link when shortening the chain by removing links. Ideally, both your pedal drive chain and your engine drive chain should have the same tension. sprocket with a screwdriver or similar object. drive chain has ¼ inch to ½” deflection with the bottom side of the chain loop tight. Reconnect the master link, and replace cover plate on engine. if the engine drive chain cannot be made as tight as the pedal chain. D. Install chain safety guard by attaching to engine and wheel axle struts. A) Mount CD ignition coil on bike frame, close enough to attach coil wire to spark plug. Mount as far away from exhaust pipe as possible to avoid heat damage to semiconductors in CDI module. B) Attach CD ignition coil wires to same identical color coded wires coming from engine. C) Install Engine Kill Switch on the handlebar or use kill switch on left hand grip. Only one is needed, but 2 are supplied. Attach kill switch wire to white wire coming from engine. This will ground ignition and stop the engine when the red button on the kill switch is activated. D) Route all wires away from engine exhaust heat. Secure wires with a plastic tie straps. *!WARNING! Operation of engine without stop or kill switch installed could result in personal injury if an emergency stop is required! The only alternate non recommended way of killing the engine is by releasing the clutch lever with bike brakes on and engine at slowest idle. A) Install clutch lever to left side of handlebar and attach cable end to lever. B) Route clutch cable through the ball-mount on motor with the big spring around the cable jacket and ahead of the ball mount. The big spring serves as a cable heat shield. C) Insert cable wire through small spring and route through clutch arm and attach brass cable-end and screw. Adjust cable tension to allow very slight play in lever. 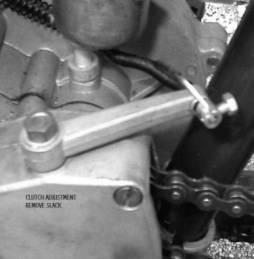 Handlebar clutch lever must be in the released or outward position to complete this operation. Procedure for attaching throttle cable to carburetor throttle slide: The small stop on the cable wire slides through the long groove of the carburetor brass cylinder slide. It held in a slot at the end of the cylinder. The spring is placed inside the cylinder slide and is compressed when the throttle is twisted. Be sure it is seated all the way inside the cylinder. The spring then forces the throttle to return. For this to work properly the throttle must twist freely on the handle bar in both directions prior to the cable being installed. A) Install twist grip throttle on right side of handlebar end. On some bike handle bars it may be necessary to ream out the handle ID to fit the bar so that the throttle will twist freely. B) After installing cable inside the carburetor mount it on engine intake tube and tighten clamp screw. Mount carburetor as level as possible. Note: The air/fuel mixture screw should be preset at 4.5 turns counter clockwise from the totally closed position. cause it to fall out. If this situation occurs, stop engine immediately and replace mixture screw. C) Attach fuel line from tank to carburetor. *NOTE: Filters are contained in the petcock and in the carburetor brass inlet. B) Remove right side cover from engine and then remove small locking screw on center flat nut. C) Pull clutch lever inward to lock catch position. D) Tighten flat slotted nut in center of clutch plate clockwise until snug. E) Back off flat nut ¼ turn counterclockwise. Release clutch lever and check for slight clutch arm 1/16” free-play on opposite side of engine. Readjust if required. Then re-install small locking screw. G). Good idea to place a small gob of grease at gear mesh area. Then replace cover. After every 5 hours of operation check the adjustment of the mixture screw by rotating screw clockwise until seated and then rotate screw 4½ turns back counterclockwise. Depending on dusty riding conditions, clean air filter every 5 to 20 hours of operation by removing the filter cover to access the screen and element. Wash element with a degreasing agent such as Simple Green™ or Purple Stuff™. Be sure element is completely dry before re-assembly. Remove spark plug and inspect for excess carbon build up. Clean, re-gap to .028- .034 of an inch if necessary. Check plug after every 20 hours of operation. New spark plugs are available from your selling dealer. Be careful using aftermarket spark plugs as heat range and threads differ greatly. After 20 hours of operation check exhaust pipe for excessive oil and carbon build-up. Be sure to use supplied support strap to secure exhaust muffler to a solid anchor point on bike frame or engine. B) Pull cap and baffle out of pipe. C) Clean with degreaser, rinse and dry. *NOTE: Excessive periods of low speed operation, idling or leaving fuel petcock in the “on” position during shut down periods may cause the pipe to become clogged with unburned fuel. C) Tighten chain if deflection is more than ½ inch. Obey all traffic regulations. Always wear a helmet while riding. Remember that you are riding a motorized bicycle and other traffic may not be able to see you. Never operate your motorized bicycle on a pedestrian through way or sidewalk while the engine is operating. 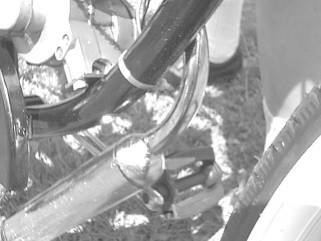 Never operate your motorized bicycle in an unsafe manner. Check local and state laws before riding on streets. WARNING! ALWAYS wear a helmet while riding. 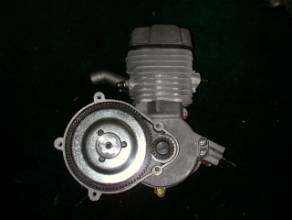 The engine is a 2 cycle design, therefore, a gasoline/oil mixture is necessary. During the break-in period (1st gallon of fuel), the ratio for 48cc is 25 parts gasoline to 1 part oil. Break in ratio for 80cc is 20 to 1. After the break-in period, the ratio is increased to 30 to 35 parts gasoline to 1 part oil. *NOTE: Use only Synthetic 2 Stroke Oil to insure proper engine lubrication. !WARNING! Remember safety first: Wipe up any spilled fuel. NEVER fuel a hot engine or smoke while fueling. This could result in sudden fire, personal injury. Always move your motorized bike at least 10 feet from any fueling area before attempting to start it. Never leave the tank fuel cap off after fueling as rain water will contaminate the fuel and cause engine failure. 2. Open the fuel valve. Small lever pointed down with fuel line is in the open position. left side of the carburetor next to the idle adjust screw. One or two times is enough. progressively downward to off position during engine warm up period. 5. Pull the handlebar clutch lever inward, to disengage the engine from the rear wheel. 7. Let out the clutch lever all the way out and continuing to pedal. The result is a direct engine hook up with the rear wheel via chain and sprocket and the engine will now start spinning, Pedal until motor starts. Accelerate slowly at first..
9. Adjust choke to the smoothest engine running position. pull clutch lever and lock in the notched catch, stop and adjust engine rpm. for the first 50 miles during engine brake in. Engine will develop more power after break in. 12. To stop the engine, push Kill switch and turn off gas valve at tank. Turning off the gas will prevent fuel from being siphoned from tank. Warning Note: Never leave the tank gas valve in “open” position” when engine is not running or the bike is in storage. 13. After or before each ride check all mounting fasteners, including hd. bolts, axle and brakes. gas and oil is mixed correctly. Proper use and maintenance is important for the continued enjoyment of your Bike Engine. This product has been manufactured to strict quality control standards. For customer assurance there is a 30 day Warranty starting from the date of original purchase from an authorized dealer:. Warranty approval is subject to factory inspection and only the defective part or parts will be replaced, not the complete kit. Only the defective part or parts should be returned to the selling dealer to be forwarded to the engine factory WD distributor for warranty replacement consideration. Parts are available thru authorized distributors or call 916 383 8612: e-mail: mike@simpsonmotorbikes.com Parts Depot in Sacrameto,CA. Please refer to your owners manual for part reference and p/n number of parts or part desired before calling. Thank for your selection of our product. Please call or write if you would like to buy a 28” bike with heavy duty 12ga spokes like this one made in China. It will accept our engine perfectly with no modifications required.